This story starts with an organic chemistry tutorial, when a student asked for clarification of the Finkelstein reaction. This is a simple SN2 type displacement of an alkyl chloride or bromide, using sodium iodide in acetone solution, and resulting in an alkyl iodide. What was the driving force for this reaction he asked? It seemed as if the relatively strong carbon-chlorine bond was being replaced with a rather weaker carbon-iodine bond. But its difficult to compare bond strengths of discrete covalent molecules with energies of ionic lattices. Was a simple explanation even possible? All is not as it seems however. The traditional explanation, found by the quick Google search linked above, is that the reaction illustrates Le Chatelier’s principle, whereby an equilibrium is driven over to completion by removal of one of the products (in this case sodium chloride or sodium bromide, which crystallize out of solution). Well, we have replaced one possible (and probably complicated) explanation based on bond strengths and ionic lattices by another based on the solubilities of an ionic material in a moderately polar solvent. But all we have done is ask a different question, which now becomes why is sodium iodide highly soluble in acetone, whereas sodium chloride and bromide are not? The answer to this is less easily found using Google! A good start would be the crystal structure of any complex formed between acetone and sodium iodide. 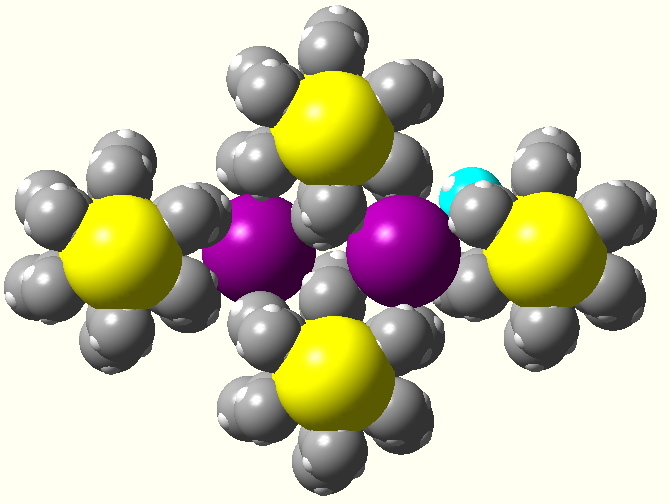 Fortunately, one such does exist, and it is shown below (sodium=yellow, iodine=purple). (Acetone)3. NaI. Click for 3D. The formula shows three acetone molecules for each sodium iodide. The carbonyl oxygen has two lone pairs of electrons, and each of these is used to coordinate a (different) sodium cation. This allows each sodium to be coordinated by a total of six lone pairs, giving it octahedral coordination. This sets up what in fact is quite a rigid scaffold, with the unusual feature of an approximately triangular shaped channel running down the lattice (two such are shown above). The size of this hole is determined by the methyl groups of the acetone, and it is into this cavity that the halide ion must fit. As it happens, the iodide anion is exactly the right size to produce a perfectly snug fit up against those methyl groups (click on the image above to view this). If a chloride or bromide anion were to be fitted into the cavity, there would be empty space surrounding it. The cavity itself is too rigid to collapse around the halide anion to absorb this space. This means these halide anions are further away from the positively charged sodium than they would like to be such that they minimize their ionic lattice energies. Instead they avoid fraternizing with the acetone at all, and form a pure sodium chloride or sodium bromide lattice (where the two oppositely charged ions CAN approach at optimal distances). The result is that sodium chloride crystallizes out of solution, and the Finkelstein reaction proceeds to completion! Acetone. NaI in spacefill mode. Click for 3D. But that is not quite the end of the story. If you view the acetone.NaI lattice sideways (click on the diagram above to view this aspect), you will find that in fact there is still space in the scaffold after all! Each iodide anion has room above or below it, with space for exactly one more iodine atom to fit without having to change the shape of the scaffold. And indeed such a molecule has been reported, but it is an odd one! The stoichiometry is now (acetone)3.NaI2, which implies that the iodide anion has been joined by an iodine atom. I2(-) is called a radical anion, and as such has an unpaired electron. Just like two iodine atoms can couple their unpaired electrons to form a covalent bond, so can two I2 radical anions, forming I42- [or I3–.I–] or on to infinity as a linear iodine polymer, of formula n[I42-], with all the I…I distances equal at 3.224Å (a system with no Peierls distortion). Straight rod-like polymeric chains of a single element might appear highly unusual, but curiously, another class of elements that exhibits this behaviour is Cu/Ag/Au and Ga, the ultimate in thin wires!). Acetone. NaI2. Click for 3D. Finally, it is worth noting that the same phenomenon occurs with the dimethylformamide.NaI complex. In this example, only the NaI and not the NaI2complex has been reported. DMF. NaI. Click for 3D. This entry was posted on Saturday, May 16th, 2009 at 9:36 am and is filed under Interesting chemistry. You can follow any responses to this entry through the RSS 2.0 feed. You can leave a response, or trackback from your own site. I just came across this having spent half an hour or more furiously googling LiBr / LiI solubilities to see what I should use for a solvent in a Finkelstein. As you say, it’s a fairly useless task (google rarely lets me down, but it did until I found this). That’s a great explanation. More than I was looking for, but interesting enough to read through. Thanks! Its been a little more than a year ago when I first posted this item. If you read the above, you will spot two crystal structures, one with the stoichiometry Acetone.NaI2. 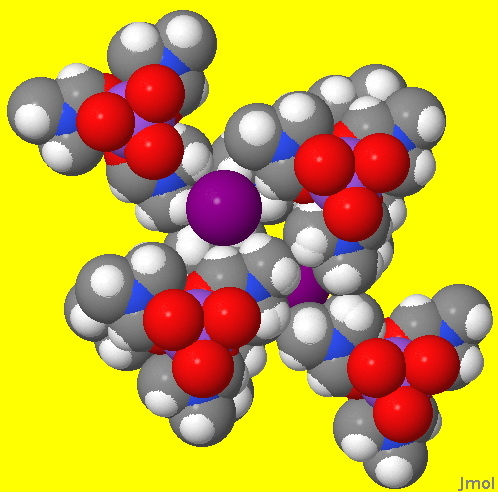 The lattice formed with the acetone has enough space to exactly accommodate an extra iodine atom (a radical). Can this additional atom perhaps be replaced by something else. Well, how about a Xenon atom, which is probably of very similar size? So the question would then be; can solutions of NaI in acetone absorb Xenon gas to any degree, and if they could, would a Xenon clathrate then crystallise out of solution? Apart from the fact that Xenon gas is expensive, it sounds like a simple experiment. Anyone up for it? The thermal ellipsoids of the iodines in acetone.NaI2 are noticeably larger along the “chain” direction than perpendicular to it. This is exactly the situation seen in Ni(pc)I. 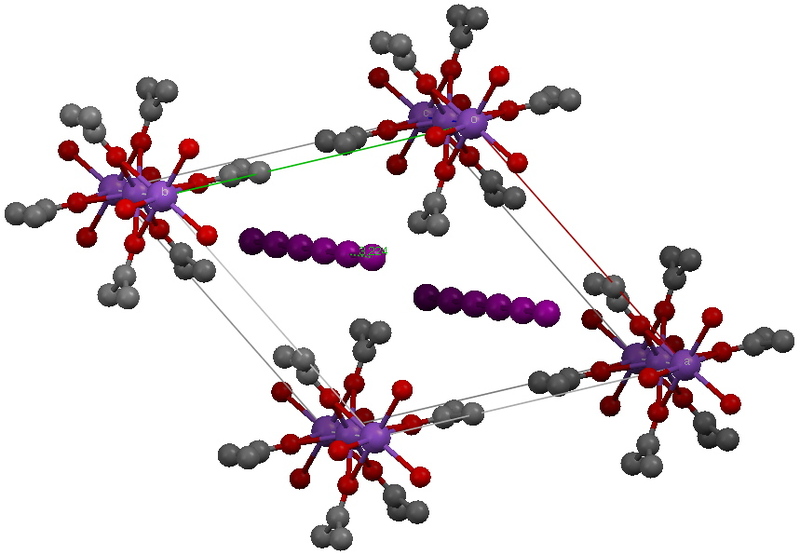 The authors of the paper where this latter structure is reported (DOI: 10.1021/ja00542a008) analysed this as being due to chains of linked (I3)- units where each chain is internally ordered but slightly slipped with respect to the other chains. This would give an average that has evenly spaced iodines with thermal ellipsoids elongated along the chain direction. It is thus possible that something of the sort is going on here in acetone.NaI2 [though not necessarily using (I3)-] and so asserting the presence of a continuous wire just on the basis of this crystal structure is perhaps stretching things a bit. About the xenon experiment. If that works, one logical extension of it might be use it to purify xenon. Wikipedia references the “Industrial gas handbook: gas separation and purification”, which discusses what sounds like a labor-intensive separation of krypton and xenon as the last step in the production of xenon. If said NaI/acetone/xenon clathrate forms, will it selectively remove xenon from a mixture of krypton and xenon? If so, Dr. Rzepa, you are on to something! Also, do any other sodium salts with anion diameter similar to iodide (such as perchlorate) behave this way also? (Yeah, I know – who wants to put perchlorate into acetone?) The xenon experiment is much more important. There is in fact an example of a Xenon clathrate, but I doubt is specific! Still, I note it here because it is such an unexpected system. One must assume it was discovered by accident! thanks for providing an in-depth insight into this seemingly shallow topic.. I had come across the same question (what is the driving force in the Finkelstein reaction?) some time ago while preparing an organic chemistry lecture. The traditional explanation is that NaX (X = Cl, Br, but also tosylate) is insoluble in acetone and this drives the equilibrium to the right. However, I feel there is some experimental evidence, that the solubility is not so important. The reaction also sems to work under conditions where nothing is precipitating (this statement might need additional experimental support). Using BDE-values for the individual bonds, I get a reaction enthalpy of ca –17 kJ/mol. If performed in the gas phase, entropy change should be close to zero, so the reaction has a negative overall enthalpy. This is a very rough calculation, I admit. It is seen that the reaction is enthalpically favored also if both salts are solids. Analysis of bond energies or enthalpies of formation reveals that the driving force is the greater stability of NaCl vs NaI, or HCl (g) vs HI (g). The thermodynamic stability of NaCl over NaI, either solid or dissolved (in my opinion) is sufficient to “pay” for the weaker C–I bond. My conclusion was that the driving force is essentially the size difference of iodide to either H+ or Na+, which leads to weaker bonds than with chloride (either by bad packing in the salt, or a weak covalent bond with H+). Long story, short conclusion: the solubility thing may not really be that important in Finkelstein reactions. Now for something (apparently) different…: How about substitution of C–I by ionic fluorides… here the reaction usually ends up with the C–F bond and ionic iodide salt. In fact, the reaction works best if the fluoride source has large cations that form weak bonds to fluoride (Cs+, K+ or quaternary ammonium). Again, the size difference in the starting material (large cation, small fluoride) is larger than in the product (large cation vs. large iodide), and this appears to drive the reaction enthalpically. Very interesting comments Lukas, and thanks for them. I would note that the enthalpies of the pure solids and gaseous MeI are for a model quite different to the reaction in acetone (the classical Finkelstein). Even if solids are not formed, the difference in solvation of NaI by acetone (vs NaCl) is likely to be quite a big perturbation to the thermodynamics pertaining to the solid state. It seems likely that the two sets of conditions (solid vs acetone solution) would require rather different models to be constructed. For those who have read my post above, please read this one, too: in the previous post I guessed, based on crude thermodynamics, that the Finkelstein reaction might be thermodynamically favored even in the absence of precipitation of NaX (X = Cl, Br) as driving force. However, as Henry has pointed out in his reply, thermodynamic data for solvated species can be a quite different story than in the solid state etc. This clearly shows that the classical Finkelstein is driven by the precipitation of NaCl/NaBr, against the thermodynamics of the homogeneous halide exchange in solution. From the K data given above, it appears that steric effects could be destabilizing the higher/branched alkyl iodides. In fact, the Finkelstein reaction is most often performed on primary, sometimes secondary, but hardly ever tertiary substrate (also because elimination is a problem). Conclusion: Precipitation is indeed very important in Finkelstein reactions! Halogen exchange is very old , but the innovation of Finkelstein was to use a solution of NaI in acetone, which gave cleaner reactions (as for example in alcohols). In his original work, Finkelstein notes that precipitation occurs and implies that this makes the reaction cleaner, but makes no clear statement about the reversibility. (DOI: 10.1002/cber.19100430257). I was searching for information about the thermodynamics of a substitution reaction. I have a different take on it. Mine is a frame of reference issue. When Lukas calculated the enthalpy of reaction, the values used were compared to the elements, hydrogen, chlorine, iodine, sodium, and the bond energies for the homolytic cleavage of alkyl halides. Therefore, if HCl is compared to HI, the bond of HCl is not necessarily stronger than HI, but the energy change from hydrogen and chlorine is greater than from hydrogen and iodine. Similarly, homolytic bond energies are being used to predict heterolytic bond strengths. I see this same error in some textbooks. This kind of error could lead one to believe that ammonia is a stronger acid than HCl based upon the bond energies. If homolytic bond energies were equivalent to heterolytic bond strengths, such a conclusion would not occur. If one were to compare how strong a bond of NaF were to NaI, I might think them to be equally weak. If there were equally weak, then we might think the greater heat of formation for NaF was due to fluorine being a lot more reactive than iodine. It seems plausible that fluorine is in fact a lot more reactive. I understand that by convention, we have given the elements a zero energy level for our calculations. That should not mean they are equally reactive. While that example can help you to understand that why the heat of formation of NaF may be greater than NaI, the bond of NaF may still be a stronger bond. This should be a trend and not necessarily a correlation. What I am missing is a scale of heterolytic bond strengths. I think the equilibrium values Lukas has referred to are consistent with the alkyl halide bond strengths. 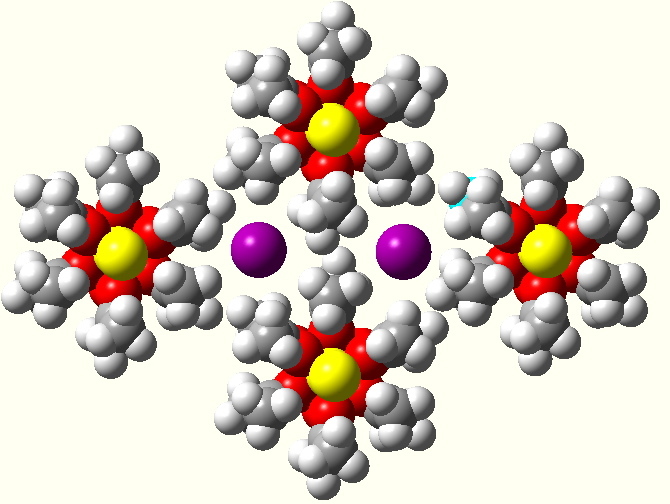 Since the inorganic halides are in solution, their bond energies can be safely ignored. The only factor should be the alkyl halide bond strengths. The increasing equilibria favoring the alkyl bromide, especially as branching is increased, seems consistent with reaction rates. The weaker the bond, the faster the reaction. That is my perspective. By the principle of conservation of energy, the mechanism, whether heterolytic or homolytic, should not matter. The same net energy difference should be found. What are the actually thermodynamics of a Finkelstein reaction? Am I even close to understanding this reaction? What a lovely comment Lukas! It is hugely appreciated. Regarding Ingold and co, I have just posted on some work done by Hilda Usherwood (his wife) in 1924, and a modern take on that. The work is of interest since it shows an early application of Lewis’ octet/shared electron pair theory to reaction mechanism (and how three different representations of hydrogen isocyanide can be formulated). Two of these in fact persist to this day, with some chemists preferring the carbene form, and others the ylide notation. Quantum mechanics of course favours the latter. if I’m trying to alkylate a hydrazine compound, and afraid of overalkylation, then using Finkelstein to make C-I in situ (from C-Br) will increase rate of fomation of overalkylated products, right? I am thinking it is better to add my hydrazine compound last. From previous reactions I’ve observed the KBr crashing out. So I am thinking if I can generate most of the C-I initially, then I can just add a load of my hydrazine and the reaction should run more smoothly, instead of adding everything together at the beginning so that you generate a mixture of C-I and C-Br, and hence a more sluggish alkylation, and possible side products. If I understand correctly, you want to use R-I to alkylate a hydrazine, because it is more reactive than R-Br? I suspect that rather than attempt a 1-pot reaction, you might be better off distilling your R-I in the first step so that it is pure, and has no R-Br, and then in a second step adding 1 mol of your hydrazine. I’m writing my PhD thesis, and in one or two chapters the FS reaction is mentioned. As I am writing up all this, although I was aware of the precipitation explanation of the reaction, I set myself out in search of some background info. Normally I would do this via the “official routes”, but now I chose simply to google. I am pleasantly surprised how this turned out! So thank you for all your comments, of which some of the mentioned refs will end up in my thesis! To confuse (or add food to thought), consider Poirier, et al in Synthesis 2006, 18, 3085-91 where Bu4NF hydrate reacting with primary iodides gives ratios of E/SN all over the place and in DMSO (RT) greatly favor elimination. Yes, the question of fluorination is, as always, very interesting. The matter with fluorides is complicated because both thermodynamics and kinetics of fluoride nucleophiles are heavily influenced by solvation AND hydration (in non-aqueous solvents). Only few truly dry AND soluble fluoride sources are known (“naked fluorides”). A standard reference on the influence of solvation on nucleophilicity/basicity of fluorides would be Landini et al, JOC 1989, 54, 328, where it is shown that the degree of hydration dramatically influences kinetics and selectivity (substitution vs elimination) of quaternary ammonium fluorides. In newer work, fluorides have been specifically solvated by tertiary alcohols, which gave ionic fluorides that show high nucleophilicity and relatively low basicity; see, e.g., JOC 2008, 73, 957. There are again strong solvent effects, but it is not clearly discussed whether thermodynamics play a role in substitution of mesylates (the rate is CsI>CsBr>CsF in MeCN, but CsF>CsI>CsBr in t-BuOH; equilibration not investigated). Clearly, progress is still happening in this field (fueled by 18F PET applications). If anyone is interested in doing nucleophlic fluorination, he/she should definitely try the t-BuOH method. Maybe somebody should write a review about naked and nucleophilic fluorides again soon. As I was looking for an explanation to why NaCl and NaBr *do* crystallize in acetone and not NaI, I came across this so clear explanation. And as I was searching for a simple and elegant test tube experiment with organic compounds to illustrate solvent influence on kinetics of SN2, the diagrams suddenly gave me an idea : why not change the size of the cage in which iodide anions fit and even polymerize ? So, I tried butanone instead of propanone. And it *did* work ! It takes about 30% to 40% *less* time to form the same amount of NaCl in butanone than in acetone. So, it seems, and repetitively, that the Finkelstein reaction is roughly 30 % faster in butanone than in propanone, using 0.4 mL of 1-bromobutane and 5 mL of a solution of 15 g of NaI in 100 mL ketone, at a temperature of 22 °C (did not try at a warmer or colder temperature). Would that be consistent with the prediction of computation ? Interesting result. As for consistency, there is no computation as such, only crystal structures. No doubt the addition two methyl groups do change the size of the cavity! Can this be explained based on HSAB theory? Softer methyl group prefers to bond with softer Iodide and so the reaction moves forward? Precipitation of NaCl or NaBr adds to the product formation? Fascinating explanation! but I cant find the original reference for the crystal structure of the first NaI-acetone solvate. Would you kindly give a link to it??? Thank you so much! P. Piret, Y. Gobilon and M. van Meerssche, Bull. Soc. Chim. France, 1963, p 205. This journal is discontinued, and a five minute search for old volumes has thus far drawn a blank. so I cannot provide any link to the article, or indeed DOI. If you find one, please send! Lukas has kindly sent me a reprint of the above article, and I link to it here. Does Finkelstein reaction works for exchanging halides in quaternayl imidazolium salts? The mystery of the Finkelstein reaction is licensed by Henry Rzepa under a Creative Commons Attribution-Noncommercial-Share Alike 3.0 United States License.